Centring on the theme of maritime expedition in an age of discovery, this is a beautiful painting by the celebrated British artist, Charles Willis. 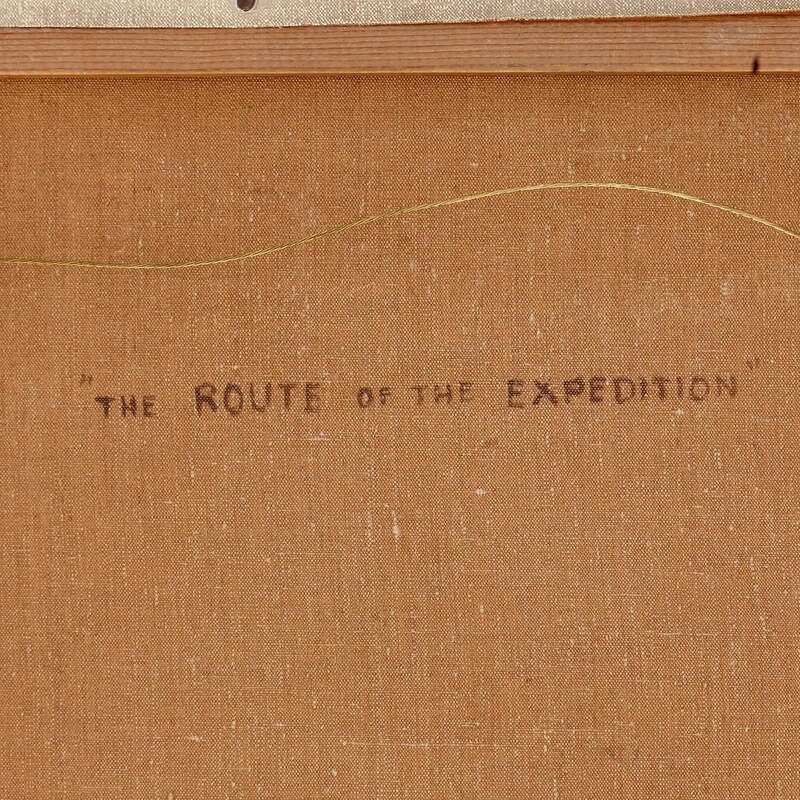 'The Route of the Expedition' is an oil on canvas group portrait, painted by the celebrated early 20th Century artist, Charles Willis. 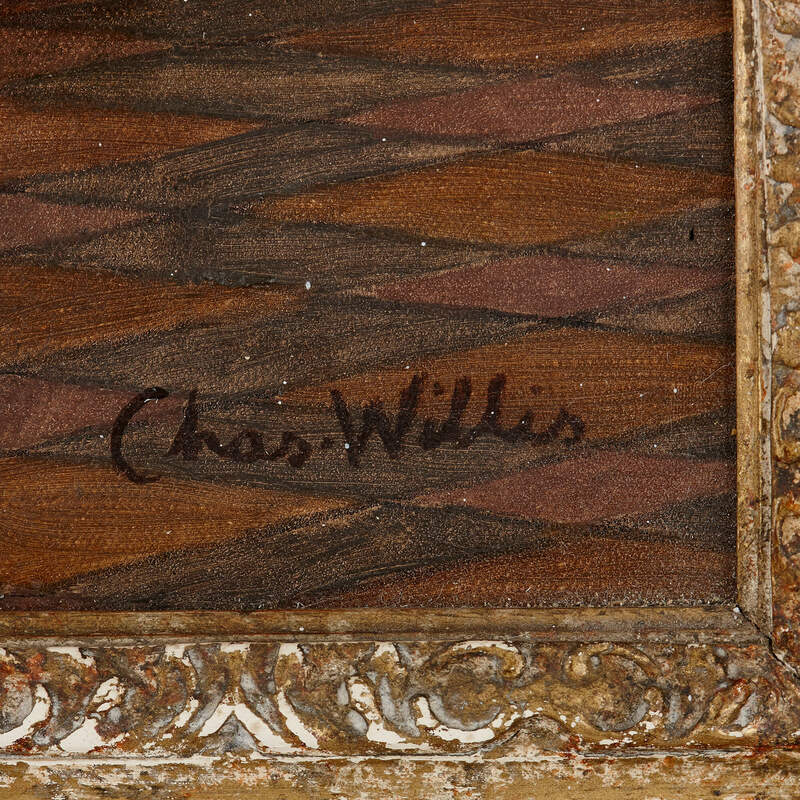 Charles Willis was a portrait painter and commercial artist who mainly produced conversation pieces. Willis was well respected in the early 20th Century, and his portraits of the royal family were used in commemorative editions of newspapers and magazines, such as for George V's jubilee and death and George VI's coronation. 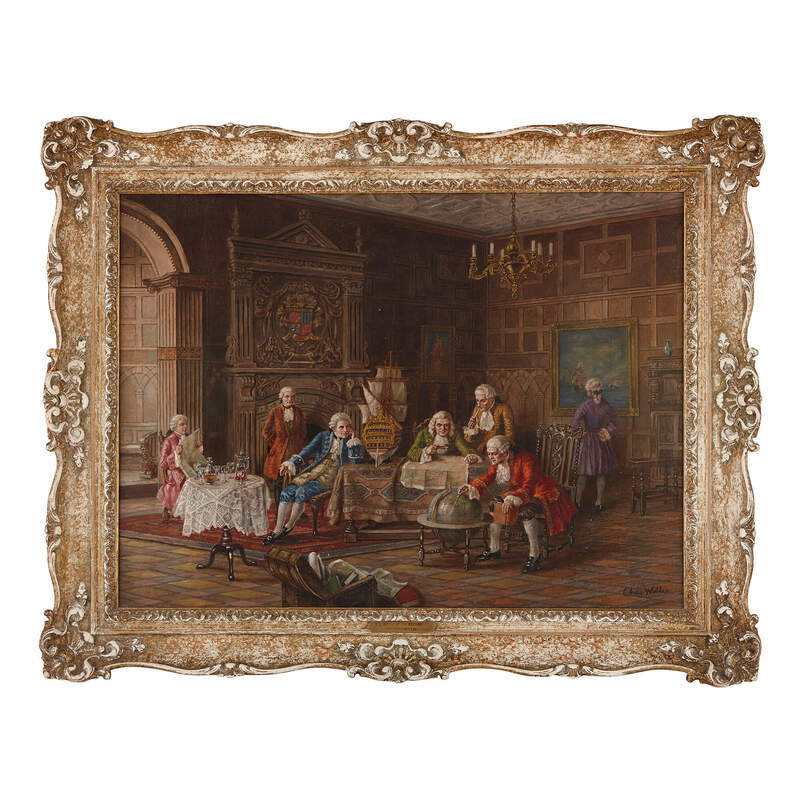 Willis's painting depicts 7 gentlemen, 4 sitting and 3 standing, in a grand oak-panelled interior, with a large carved classicising fireplace featuring a heraldic shield. The gentlemen wear 18th century costume, each item a different colour. At the centre of the composition, a man leans forward in his seat and places his compass at a point on the miniature terrestrial globe before him. He points, it seems, to the north-eastern area of south america. 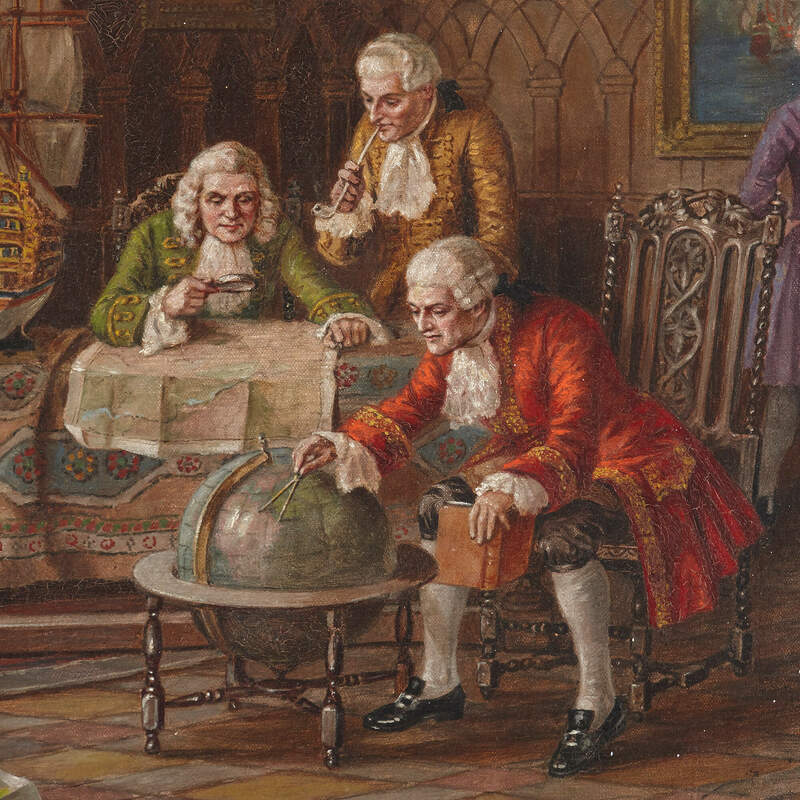 Behind him, two men, one holding a microscope, survey a map, which is spread out on a table. A small replica of a sailing ship, clearly built to carry cargo, is propped up on the table beside them. Two other men, to the left of the composition, watch on, and another examines a map. 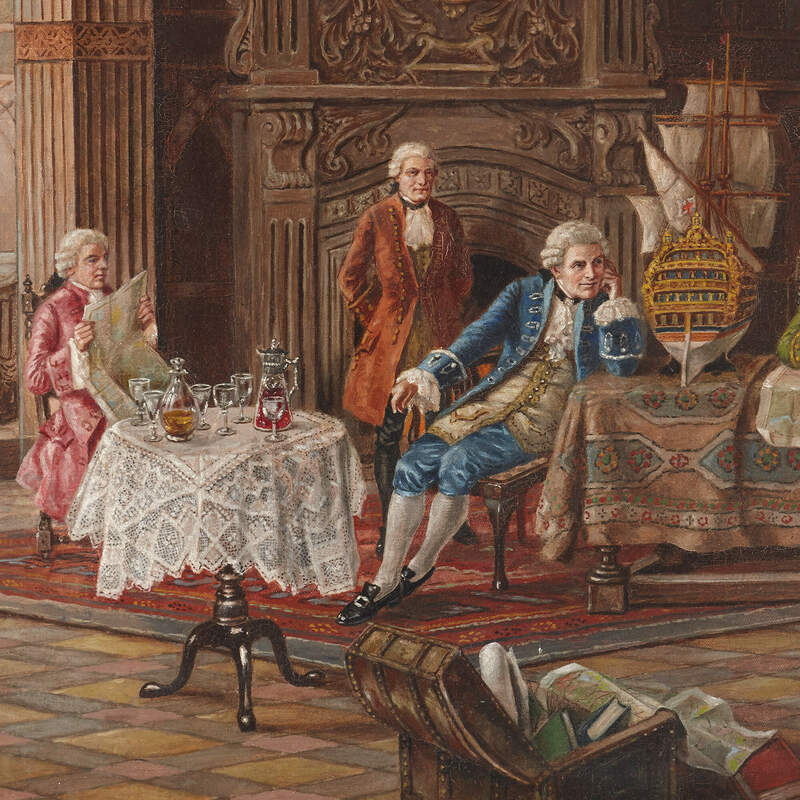 In the background, on the right-hand side, a man stands with his back to us and inspects either a maritime painting, or a portrait that hangs on the fireplace wall. Located in the foreground, and helping to lead the viewer's eye into the composition, is an open trunk, spilling forth books and maps. The painting focuses on the theme of maritime expedition, which was at the heart of the Age of Discovery, and bolstered by Enlightenment thinking. Such voyages were often conducted in the hope of establishing or expanding colonial empires, thus creating new opportunities for trade. 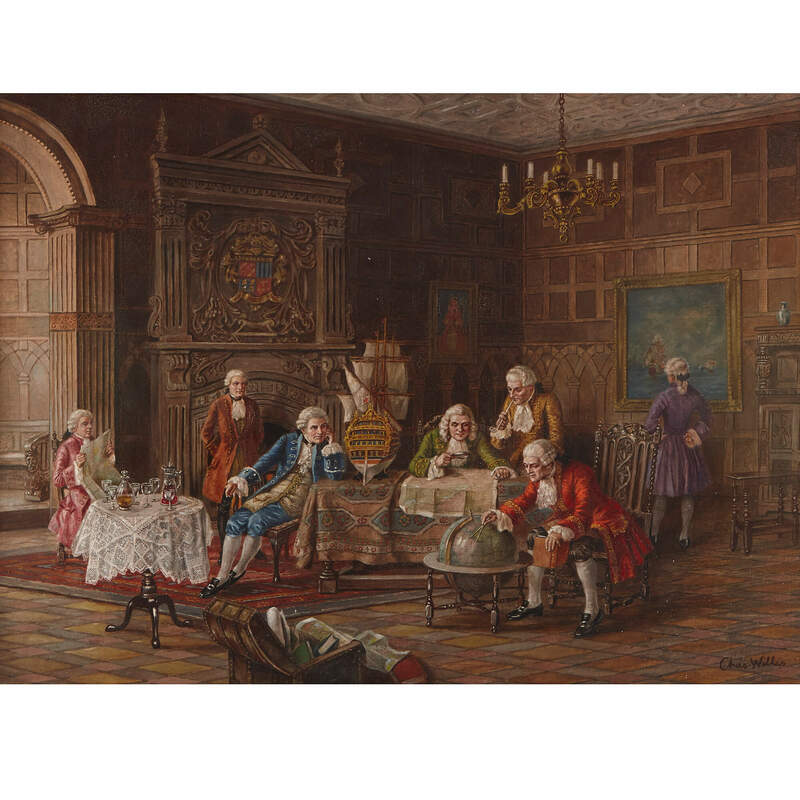 The painting is signed 'Chas Willis' in the lower right corner, and inscribed 'The Route of the Expedition' on the reverse. 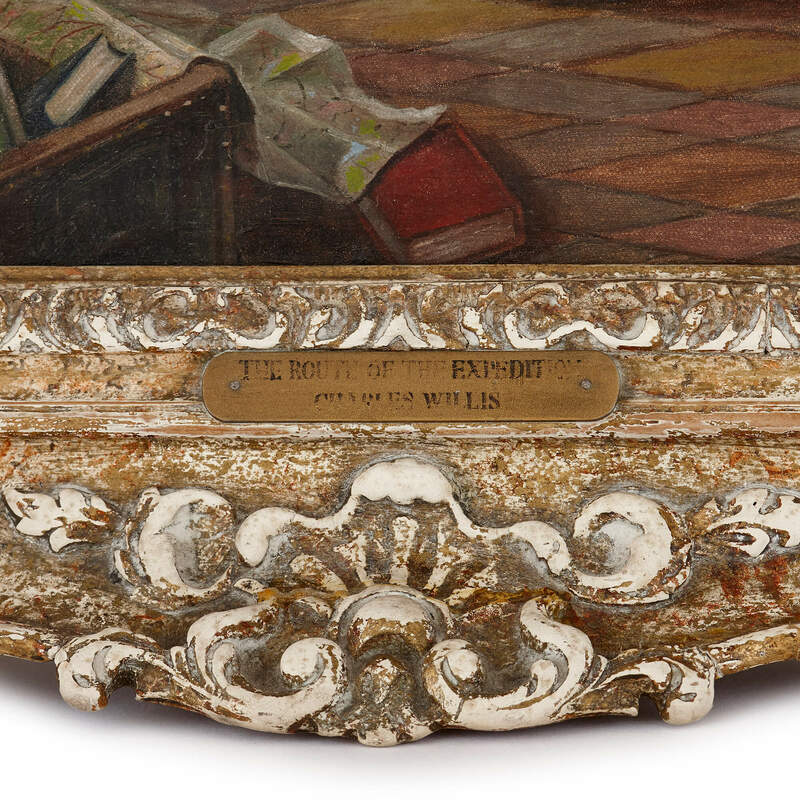 A title and artist plaque is attached to the frame, which is made of wood and painted white.